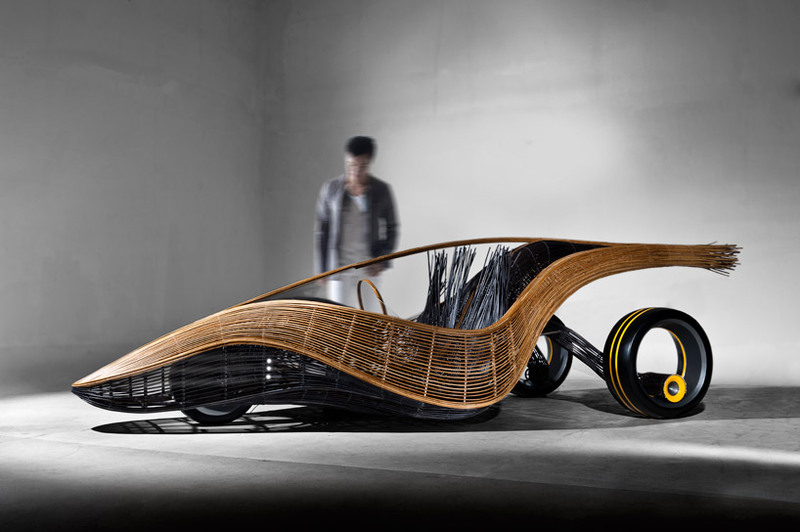 filipino designer kenneth cobonpue and german product designer albercht birkner explore the connections between technology and nature in the ‘phoenix’ bamboo concept car. 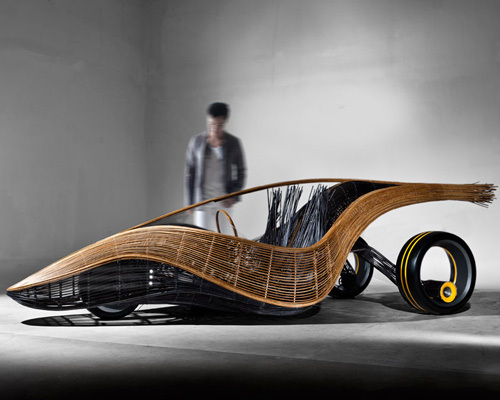 in 10 days, craftsman and weavers handmade the automobile from bamboo, rattan, steel and nylon. the form of the outer shell mimics the structure of a leaf, using a single spine similar to those found in vertebrae and plants. the exterior shell is woven starting at the front, proceeding to the rear, enveloping the interior which seamlessly forms the dashboards and seats as it continues backwards. the two parts are connected in the tail of the vehicle, creating the ‘stem’. phoenix does not only focus on the form, but also the idea of a car being heavy and industrial. the biodegradable materials challenge the notion of dense, long lasting materials in vehicular design. it looks at the option of inexpensively and ecologically replacing the shell if need be while maintaining the same inner construct. the proposal introduces nature and craftsmanship into automotive technology. Finally a concept car that wakes us up from sleep caused by the clones of the car industry. In any case, this concept car is truly innovative: its formal conception, its aesthetics, the materials employed. More importantly, it is a concept car, so let us hope declinations as interesting as the model presented in this article. that man in the picture is kenneth cobonpue..